The Utah Genealogical Association (UGA) is pleased to announce the opening of registration for the 2012 Salt Lake Institute of Genealogy (SLIG)! A premier educational opportunity, SLIG is highly regarded among professional and serious researchers. Registration will open at 9:00 AM Mountain Time ( 11:00 AM Eastern and 10:00 AM Central) and will be accessible via the UGA website at http://www.ugagenealogy.org/. Tuition is $350 for UGA members and $400 for everyone else. You MUST be logged in to the members area of the website prior to registering to receive the member discount. 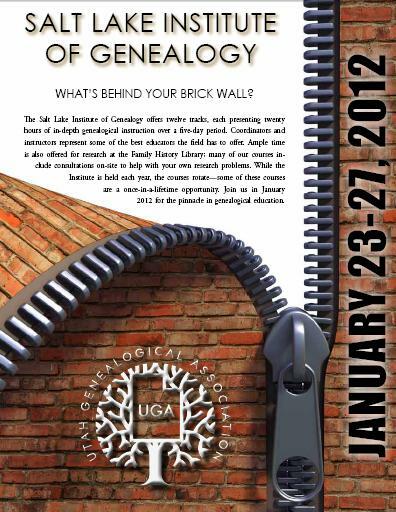 If you are not a UGA member, but would like to receive the discount, you may join the society for $35 for the year. It is highly advisable that members check their logins before Saturday, June 4th, and that new members join prior to Saturday as well. These tuition prices are applicable through October 30, 2011 when the early-bird registration expires. (Non-early-bird tuition is $400 for UGA members and $450 for everyone else.) Two payment options have been provided: pay online with your credit card via PayPal or pay via check through the mail. Your place in the course is reserved upon checkout. The Salt Lake Institute of Genealogy will be held January 23, 2012–January 27, 2012 with a welcome social the evening of January 22, 2012. The Plenary Session will be presented Monday, January 23, 2012, at 7:00 PM by Thomas W. Jones. The topic is "The Genealogical Proof Standard: What It Is and What It Is Not" and is free to the public. A banquet will be held to honor graduates on Friday, January 27, 2012 at 7:00 PM. Awards will be presented at the banquet, including the prestigious Fellow of the Utah Genealogical Association (FUGA); Lou Szucs will present the banquet program, subject TBD. We will again be offering evening sessions. These sessions are open to both registrants and the public for $10/each. For a full schedule visit our website. Due to their smashing success in 2011 we will again offer vendor lunches Monday through Thursday. A standard lunch hour will facilitate these lunches and ensure students are able to attend without disrupting their regular class schedule. The vendor lunch schedule is available online and tickets can be purchased through the SLIG registration process. We highly recommend staying at the conference hotel, the downtown Salt Lake City Radisson. The rate is $85/night for single or double occupancy, The UGA rate is available from January 19, 2012–January 30, 2012. RootsTech begins February 2, 2012 and also has a dedicated rate at the Radisson as well. If you are staying through both conferences please send an email to [email protected] with the subject line SLIG/RootsTech Hotel and the dates you are staying to ensure your hotel reservations are processed correctly. Book your SLIG reservation directly through our website—link will be available shortly. The Salt Lake Institute of Genealogy has been providing top-notch genealogical education for fifteen years. The courses are primarily focused at the advanced level, with Course 1: American Research and Records Parts 1 and 2 with Paula Stuart-Warren, providing a good intermediate foundation. SLIG is structured in "tracks". Each track equates to either a locality or a methodological subject. Each track provides at least twenty hours of in-depth instruction. Students choose one track for the week and leave with a deeper understanding of their chosen topic than a traditional conference can impart. SLIG is dedicated to providing a forum for the best genealogical educators in the field to present their knowledge to avid family historians. 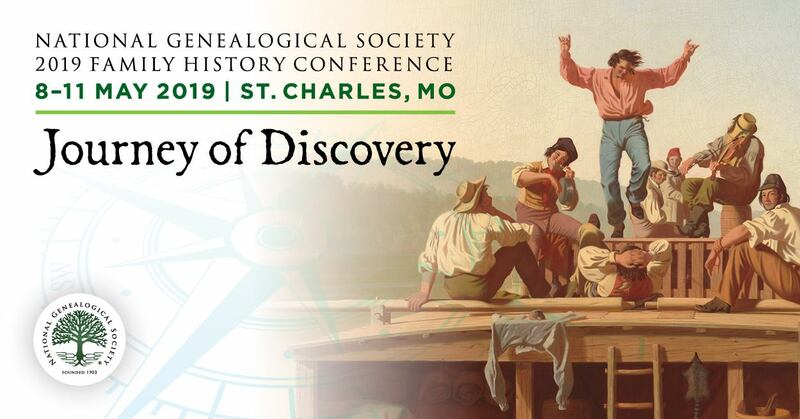 The Utah Genealogical Association (UGA) is an enthusiastic community of researchers who desire to improve their research skills and more effectively utilize genealogical resources within Utah. UGA provides genealogical information, sources and education through personal instruction and published media on state and national family history topics, while promoting high standards and ethical practices. Editor’s Note: Check out the program brochure! Follow NGS via Facebook, YouTube and Twitter. I Found It At the National Archives Contest! Today is Ask an Archivist Day on Twitter!